Ebola invariably caused deaths in the communities where it spread across Guinea, Liberia, Sierra Leone, and elsewhere. It also brought about an unparalleled level of awareness of the disease and, consequently, a number of solutions to combat it effectively. Highlight™ stands out as a noteworthy discovery among the numerous initiatives devised by students and scholars around the world in an effort to fight the virus. Highlight is an ingenious product: a colorized powdered additive mixed directly into bleach before spray decontamination. The product is manufactured by Kinnos Inc., which was founded by three Columbia University graduates—Jason Kang, Kevin Tyan, and Katherine Jin. In February 2015, the team won the USAID Fighting Ebola Grand Challenge, which encouraged students and faculty to devise successful solutions for the West Africa Ebola crisis. As I learned myself after a year of working with International Medical Corps in Guinea, one of the most challenging aspects of fighting Ebola is ensuring that personal protective equipment (PPE) and other materials used are fully decontaminated. Bleach is an effective disinfectant, but because it is imperceptible to the eye, it can be hard to ensure that an entire surface is fully free of the virus. Initially, the Kinnos team looked to color the PPE, but then Kevin had a brilliant idea: what if they came up with a product that colored the bleach? But they did not stop there. Highlight is not only highly visible, but it also fades in color to show when decontamination is complete. It also improves the consistency of bleach by modifying its physical properties to form a film rather than droplets, further increasing coverage. Unlike bleach—which can fade in two to three minutes in sunlight—Highlight slows down evaporation, and thus adheres to the 10-minute World Health Organization standard period of safe decontamination. After initial tests and feedback from health care workers and biomedical experts, Highlight—an additive that dyes bleach—was ready for primetime. Kinnos did demonstrations in the U.S., Belgium, and Liberia. 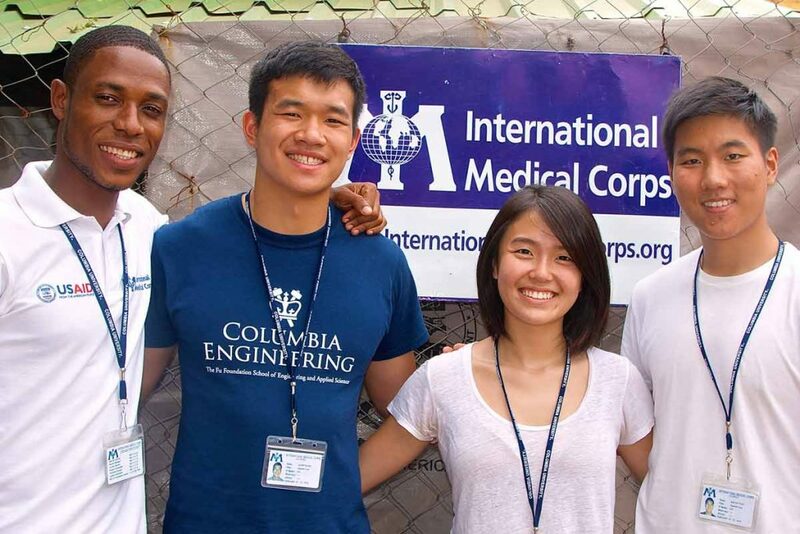 Most recently, the team traveled to Guinea to test Highlight with International Medical Corps. This is when I had the opportunity to meet them and learn about Highlight. Kinnos and International Medical Corps ran simulations at Donka National Hospital, the country’s largest, in the capital Conakry. They were done at the hospital’s Screening and Referral Unit (SRU), where patients entering the facility are checked for any signs and symptoms of Ebola. If someone is suspected of having Ebola, he or she is moved to an isolated area before being transported to the nearest Ebola Treatment Unit (ETU) for testing and treatment. Together with the Rapid Response Team Manager, Oscar Loua, I was in charge of facilitating activities on the ground for Kinnos. Being part of the daily testing routine allowed me to experience Highlight first-hand. 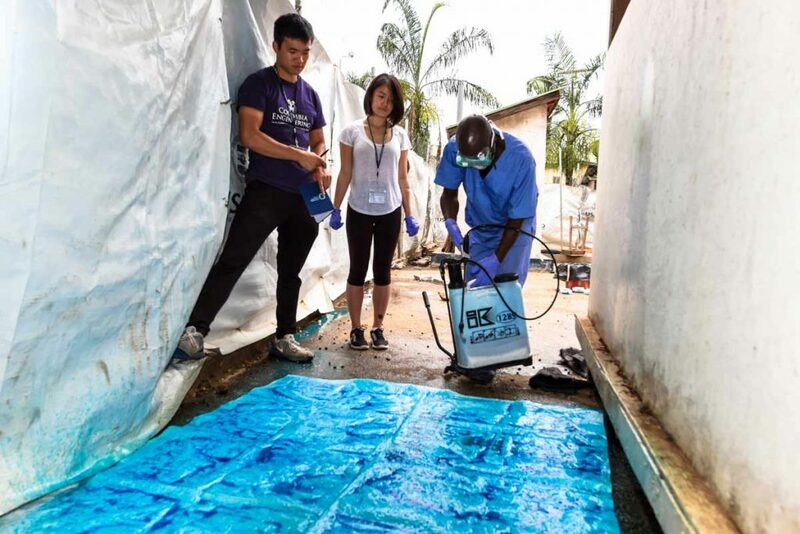 In addition to the brilliant idea of developing Highlight, what impressed me most about Kinnos was the team’s unfaltering patience to perfect a product that was so relevant in the combat against Ebola. Highlight can indeed be integrated in any decontamination process: the Fire Department of New York has already incorporated it into its HazMat unit decontamination protocol. And what is the next step for Kinnos? Ideally, Highlight will serve a two-pronged goal—not just in rigorous disinfection, but also for preventative purposes. Current tests in hospitals in the U.S. could lead to the inclusion of Highlight in daily decontamination protocols of health infrastructures. Results from the Highlight trials in Guinea will be shared with the Ministry of Health, as Kinnos advocates for continued collaboration with International Medical Corps. At present, with funding from the U.S. Agency for International Development’s Office of U.S. Foreign Disaster Assistance (OFDA), International Medical Corps’ Rapid Response Teams investigate suspected Ebola cases and transport patients as needed to ETUs for diagnostic testing. These teams will also demonstrate Highlight in villages, gaining valuable feedback from the beneficiaries it was designed to serve. One day, when Highlight will be used not only to fight Ebola, but also for routine decontamination in hospitals in the U.S. and beyond, I hope that Jason, Kevin, and Katherine will realize their engaging personalities and empathy towards the local culture contributed as much to their success as their genius.